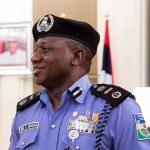 KOGI, NIGERIA (AFRICAN EXAMINER) – The Inspector-General of Police IGP, Mr. Ibrahim Idris, has ordered the immediate removal of the Kogi State Commissioner of Police, Mr. Ali Janga. Similarly, IGP directed the redeployment of the Commander, Federal Special Anti-Robbery Squad in the state, the Divisional Police Officer ‘A’ Division, Lokoja as well as other police officers implicated in the escape of the six suspects in the arms case against the embattled Senator Dino Melaye Kogi State. The officers were accused of negligence, ”dereliction of duty and gross misconduct”. IGP in a statement by the Force Spokesman, Mr. Jimoh Moshood, explained that the affected policemen would face serious disciplinary action. Before his removal, the State Commissioner of Police, Mr. Ali Janga, confirmed six suspects involved in Sen. Melaye’s arms case have escaped from the police custody. 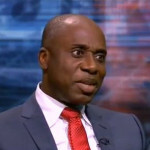 Janga added in the email that 13 policemen on duty at the ‘A’ Division, Lokoja, have been detained over the incident. According to the CP, the escaped suspects include: Kabiru Seidu a.k.a Osama, Nuhu Salisu a.k.a Small, Aliyu Isa, Adams Suleiman, Emmanuel Audu and Musa Mohammed. He also said “consequently, all the six suspects, Senator Dino Melaye and Mohammed Audu were sent for watch-listing and red notice by the INTERPOL for immediate arrest anywhere we see them”. Melaye who is also facing the recall challenge in his Kogi Western zone has traveled outside the country. 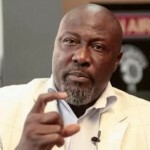 Meanwhile, the Nigeria Police Force has declared Senator Dino Melaye wanted. Also before his removal, the Kogi State Commissioner of Police CP Mr. Janga made the declaration Wednesday at a news conference in Lokoja, the State capital adding that the son of the state late ex-governor, Mohammed Audu and Melaye have been placed on Interpol watchlist. 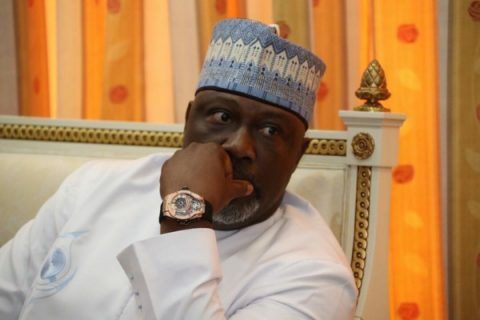 Recall that IGP Idris announced last weekend that Melaye would be declared wanted if he fails to appear at the headquarters of Kogi State Police Command latest today (Wednesday).